Ali has traveled extensively on international charitable missions and devoted his time to philanthropy and social causes. Boxing great Muhammad Ali was honored Thursday with the Liberty Medal for his longtime role outside the ring as a fighter for humanitarian causes, civil rights and religious freedom. Hundreds of people gathered on the lawn of the National Constitution Center in Philadelphia to watch the three-time heavyweight title holder receive an honor that his wife, Lonnie Ali, called "overwhelming." "It is especially humbling for Muhammad, who has said on many occasions, 'All I did was to stand up for what I believe,'" Lonnie Ali said. The 70-year-old retired champ, hobbled by a 30-year battle with Parkinson's disease, did not speak. 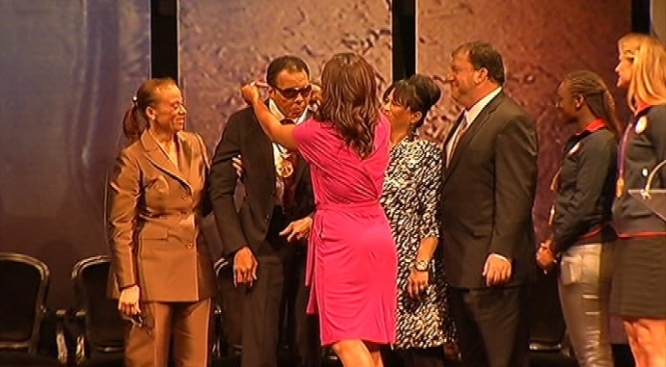 But he stood with assistance to receive the medal from his daughter Laila Ali. He looked down at his medal for several moments and then waved to the crowd. The award comes with a $100,000 cash prize. Ali was born Cassius Clay but changed his name after converting to Islam in the 1960s. He refused to serve in the Vietnam War because of his religious beliefs and was stripped of his heavyweight crown in 1967. A U.S. Supreme Court ruling later cleared him of a draft evasion conviction, and he regained the boxing title in 1974 and again 1978. One of his most famous fights took place in Zaire, now the Democratic Republic of the Congo, where he battled George Foreman in the "Rumble in the Jungle" in 1974. At the ceremony Thursday, retired NBA star Dikembe Mutombo recalled the impression Ali's visit made on him as an 8-year-old growing up in that country. "He changed my life," said Mutombo, who also is a trustee of the Constitution Center. "I can never forget how inspired I was to see a black athlete receive such respect and admiration. He changed how the people of Zaire saw themselves, and in turn how the world saw them." Since hanging up his gloves in 1981, Ali has traveled extensively on international charitable missions and devoted his time to social causes. Ali received the nation's highest civilian honor, the Presidential Medal of Freedom, in 2005. He also has established the Muhammad Ali Parkinson Research Center in Phoenix and a namesake educational and cultural institute in his hometown, Louisville, Ky. The National Constitution Center, which opened in 2003, is dedicated to increasing public understanding of the Constitution and the ideas and values it represents. It awards the Liberty Medal annually to a person who displays courage and conviction while striving to secure freedom for people around the world. Previous Liberty Medal recipients include rock singer and human rights activist Bono, former South African President Nelson Mandela and former President Jimmy Carter. Six winners later received Nobel Peace Prizes. Also presenting the honor to Ali on Thursday were U.S. Olympic athletes Claressa Shields and Susan Francia. Last month, the 17-year-old Shields became the first U.S. girl or woman to win a gold medal in boxing. Francia is a two-time rowing gold medalist from Abington, just north of Philadelphia.